Members of UNHRC 'Schabas Commission' prevented from entering the country as Israel says it won't cooperate with 'biased' probe. 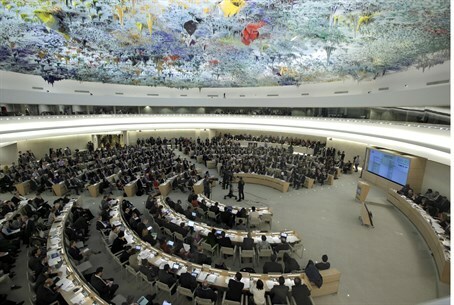 Israel has reportedly prevented members of the UN Human Rights Council (UNHRC) panel, set up to investigate "war crimes" allegations following last summer's Operation Protective Edge, from entering the country. According to Channel Two, three members of the Schabas commission were refused entry into Israel from Jordan on their way to Gaza. The three UN-appointed officials are currently still in Amman. The decision to prevent them from entering was the clearest signal yet that Israel will not be cooperating with the probe. Shortly afterwards the foreign ministry confirmed that was indeed the government's stance. "Since the Schabas commission is not an inquiry but a commission that gives its conclusions in advance, Israel will not cooperate with the UN Commission on Human Rights over the last conflict with Hamas," foreign ministry spokesman Emmanuel Nahshon said in a statement. The decision had been taken because of the "obsessive hostility against Israel of this commission and the words of its president against Israel and its leaders," he added. Many Israelis have branded it "Goldstone 2," after the infamous Goldstone Report set up following Operation Cast Lead in 2009 which was slammed as one-sided and anti-Israel by critics. Israel has already dismissed the Schabas commission as a "kangaroo court," noting the rather blatant anti-Israel credentials of the committee's head, William Schabas. For his part, Schabas has denied being anti-Israel - but then went on to acknowledge that his previous record raised questions about his objectivity. "I will put my prior positions aside," he said to the Arab-language newspaper Asharq al-Awsat. Israeli officials, however, remain unconvinced; Israel's UN Ambassador Ron Prosor compared appointing Schabas to head the inquiry to "choosing Count Dracula to run a blood bank," and Foreign Minister Avigdor Liberman said Israel should not cooperate with the probe. In an interview with Israeli TV the Canadian law professor did not deny that the international community has a double standard regarding Israel's conduct of war.